With such a strong endorsement from the New York Fed as well as others in the economist community, the yield curve is one of the most widely watched indicators regarding the health of the US economy. More specifically, when the spread between the yields on the ten-year and three-month US treasuries inverts, or turns negative, there is a high probability of a recession on the horizon. The chart below shows the yield curve since the beginning of 2009. 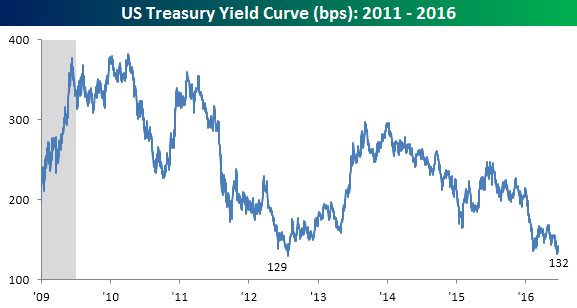 As shown in the chart, the slope of the yield curve peaked shortly into 2010, and outside of a brief period in late 2013, has been trending lower the entire time. Interestingly, in just the last few weeks, the slope of the curve has flattened further and is now within 3 bps of its flattest level of the cycle. While the slope of the curve is still far from being inverted, flatter yield curves are generally associated with lower rates of economic activity. In that light, the flattening of the curve isn’t exactly sending a bullish signal regarding economic growth.